There are still pinks getting caught at Ambleside and Furry creek. The tides are going to be in our favour from the 24th to fish off the beach. There were a few reports of wild coho caught on both fly and gear. I am looking forward to September, as it is my favourite time to fish the beach, both coho and chinook move into the estuary. As for flies you might want to try switching from Euphaucid patterns to more streamer/wooly bugger type flies. Remember that chinook actually feed so you can fish baitfish patterns with a clear tip or full intermediate clear line to get you fly a little bit deeper. The chinook fishing has been excellent this week and this should be no surprise as we are at the peak week for this fishery. There have been lots of fish caught off the Bell Buoy and the hot depths on the riggers have been from 20-80 with the bulk of the action in the 30-60 range. As usual the best producer is bait. Anchovies and herring in glow green and glow green chartreuse are hot. The best flashers have been green or chartreuse with some glow tape on them and on the deeper rods the double glow flasher has been hot. We had some double headers this week as there seems to be some pretty sizeable schools of chinook in the area. Make sure to bring at least a couple of packs of bait with you because if you get on one of these schools you will need it. The vast majority of the fish have been red springs in the low to mid teens although there have been a few in the 20 pound range and even a few just over 30. 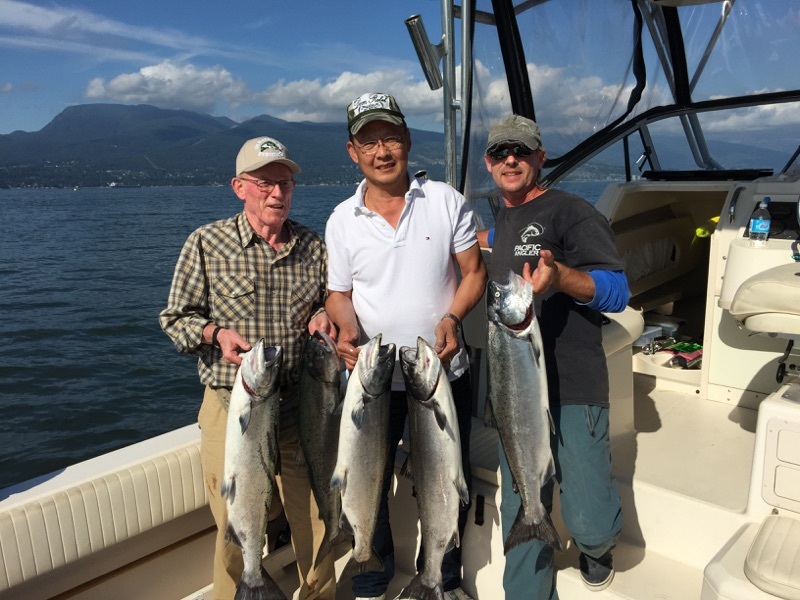 Eddie and his guests with some nice chinook! There are good numbers of pink salmon around as well and they will hit the anchovies when you are fishing for chinook. Most of the Fraser pinks haven’t shown up yet but this will change later this month and the first week of September. In the meantime we would recommend concentrating on chinook with bait. I spent some time on the phone with DFO this week talking about the recent closures. As you know the closures have been put into effect to protect the summer run sockeye as the run is much lower than expected and the Fraser is low and warm so they are expecting some in river mortality. This means they really don’t want the saltwater anglers to catch sockeye so avoid using pink hoothcies as the sockeye will bite this, and of course so do the pinks. The pinks will readily bite anchovies as well and you will catch chinook on anchovies, so it obviously makes sense to keep the pink gear off and use the bait. 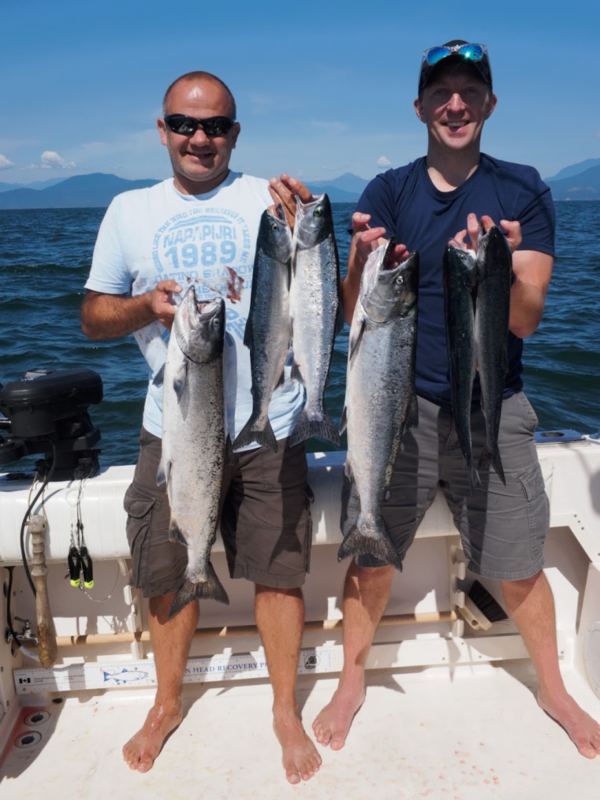 Matt and friend with pinks and a couple nice chinook. There haven’t been too many boats off West Van shoreline as all the boats have been over at the Bell Buoy chasing chinook. There are lots of pinks and coho around but with the consistent chinook fishing we haven’t been in West Van all week. The coho are getting pretty stale and who can blame them as they have been sitting off the beach for a month or two already. They are getting hard to catch and this means you should fish bait. We are still getting some on white hootchies, but bait usually starts to work well this time of year for coho. You also have a good chance at catching a chinook as some of the Fraser chinook get pushed into this area on the flood tide. The first Capilano white springs will also show up this coming week, so when that rod bounces, don’t immediately assume it is gong to be a small Capilano coho. 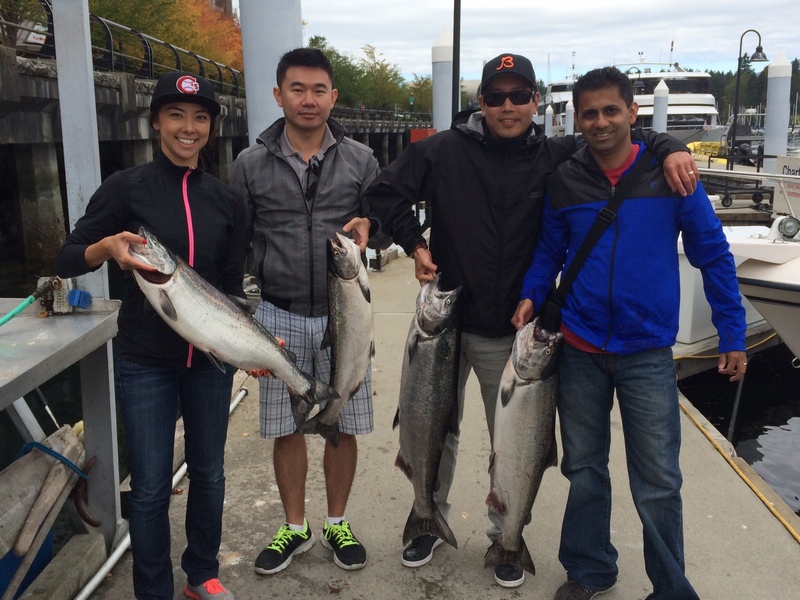 Dimitri’s guests with 4 nice chinook caught on a 5 hour trip this week. If you need some chinook gear, come down to the shop, we have the hot flashers and teaser heads, lots of herring and anchovies, and of course salt. If you are thinking about booking a charter, now is the time, as we are at peak timing for chinook. See you in the shop or on the water.